Boca Java is a company that sells different flavored teas and coffees. I love trying new kinds so when I had the opportunity to choose a few products to try, I tried to choose some that I had not had before. When I saw the Maple Bacon Morning coffee, I knew that that was a must-try since it was so unique. Friday morning, I had had the day off of work so I brewed up some of this coffee for my husband before work and for my Mom and I for our errands that we were going to run. I added 5 tablespoons for one pot since I like my coffee weaker than most people. I poured a cup to-go in a travel mug with some skim milk. The coffee was tasty but I did not taste much of a smoky flavor or a maple flavor. It was much milder than I would have expected. I liked it but wish that it had a stronger flavor of the bacon maple. The tea was excellent. As I type this, I am sipping a cup of the Caribbean green tea. It is very flavorful and naturally sweet without any added sweeteners. I am impressed. The tea comes in pyramid tea bags and brews quickly. It tastes like citrus and has a tropical flavor. The Jasmine tea is great as well. I love Jasmine in tea which I recently discovered. I was surprised that neither of these teas were bitter at all. 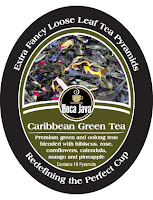 I was impressed with the Boca Java tea but think that the coffee could use some additional smoky sweet flavor. I want to try the Chocolate Hazelnut Heaven decaf coffee and the Mandarin Orange Rooibos tea. Oooo, anything Hazelnut is a gr8 thing!! I would love to try the Bananas Foster Float Coffee! Boca Java has a contest too. A year of coffee would be SSSWeet! I'd like to try the Vacation Villa Vanilla Coffee. I'd love to try the Mandarin Orange Rooibos! I want to try the Bananas Foster Float Coffee! thanks for the giveaway! Oh wow I'd love to try this - Bananas Foster Float Coffee. I would love to try the German Chocolate Cake Coffee. I'd most like to try Espresso :) *Thanks* for the giveaway! I'd like to try the Boca Villa dark roast coffee. Thanks for the giveaway. My husband is the coffee drinker in our house, and he likes dark roasts so I'd pick the Boca Villa. How could I not want to try the Maple Bacon Morning coffee? I want the Maple Bacon Morning Coffee. Boca Villa is my coffee of choice! I would love to try the Tropical Kiss Coffee. I would like to try the Bananas Foster Float. I most want to try the Bananas Foster Float Coffee!